A network of tubes whisking passengers across a country at close to the speed of sound may seem like a sci-fi pipe dream, but in the already futuristic city of Dubai it would fit right in. The city-state just hosted a two-day competition for designs related to a high-speed system known as a hyperloop, in which levitating pods powered by electricity and magnetism would hurtle through low-friction pipes at a top speed of 1,220 kph (760 mph). The idea, first proposed by Tesla co-founder Elon Musk in 2013, is still being tested. But Dubai has already partnered with Los Angeles-based Hyperloop One to examine possible lines going to the United Arab Emirates' capital, Abu Dhabi, and elsewhere. At a presentation Tuesday, Hyperloop One suggested such a network could include an undersea tunnel connecting Abu Dhabi to Doha, Qatar, with a trip time of just under 22 minutes. The network could extend to the island nation of Bahrain and Saudi Arabia. "Imagine that you can live in Riyadh, work in Dubai, have your dinner in Abu Dhabi and watch a movie in Qatar," Saif al-Aleeli, the young CEO of the Dubai Future Foundation, which hosted the competition, told The Associated Press. "Dubai is trying, as a mission, to prove that concept." The heart of this effort can be seen around the Emirate Towers, where the office of Dubai's ruler, Sheikh Mohammed bin Rashid Al Maktoum, looks out on a glass skyline that was mainly built in the last 15 years. Outside, construction has begun on the Museum of the Future . The world's first office entirely built of material made by 3-D printers sits nearby. A mall underneath the towers looks like one of Dubai's many luxury shopping centers until you see the robot assisting customers at a local bank branch. Just around the corner is the Dubai Future Foundation, the government initiative that helped sponsor the hyperloop competition with the city-state's Roads and Transportation Authority. 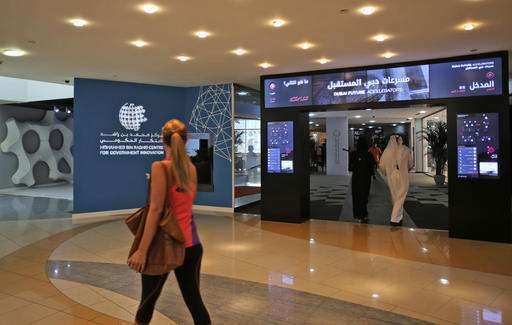 Sheikh Mohammed visited the foundation Monday, putting on a virtual-reality headset and walking among its chic offices filled with 3-D printers and other gadgets. "Our goal is to anticipate challenges and explore future investment opportunities," a message on Sheikh Mohammed's official Twitter account later read. "We all need to think afresh as we develop for the future." It's unclear how much a regional hyperloop network would cost—or who would pay for it at a time when Gulf budgets are strained by low global oil prices. But Dubai is already home to the world's tallest building, the longest driverless metro line and long-haul carrier Emirates. A hyperloop network could cement its status as a global transit hub for decades to come. Government-backed port operator DP World has held talks with Hyperloop One about cutting transport times for its cargo, said Chris Vasquez, the director of product development for the hyperloop company. Such a system could be in place in Dubai as early as 2020, he said. "This is a place where big things happen," Vasquez said. "They don't get bogged down by regulations, not that those things aren't important and don't deserve due diligence, but we've all seen projects stalled by over-crippling regulatory environments where it just stalls for years and years and years." 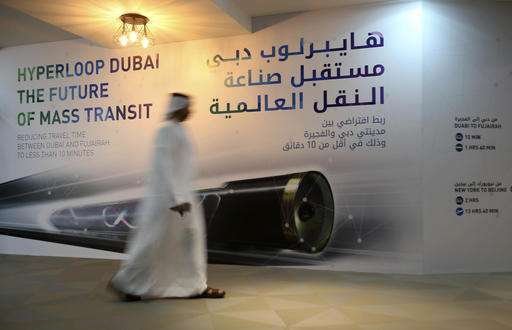 At the ceremony Tuesday, selected groups involved in the 48-hour hyperloop project presented ideas for a possible track between Al Maktoum International Airport at Dubai World Central, Dubai International Airport and Fujairah International Airport. Under their plans, the hyperloop trip of some 145 kilometers (90 miles) over a mountain range would be 10 minutes or less, compared to the current hour and 20 minutes by road. Focusing less on the science, those involved offered visions of hyperloop stations and seating inside bullet-shaped transit cars. A team from Paris-based transit company Systra won the competition, walking away with a certificate and a crystal trophy resembling Dubai's Burj Khalifa, the world's tallest building. But among the contest's competitors were few Emiratis, though others attended the event watched over by white-gloved Asian waiters serving hors d'oeuvres. Asked about the low participation, al-Aleeli, the Dubai Future Foundation CEO, said Emirati university students on hand for the event would help lead the UAE in future innovations. "We are paving the road to build the right future for them," he said. What would the speed of sound actually be inside the near-vacuum inside the tubes? Reagan CHANGED All of That ! Thanks for the info, but it's my understanding they can only remove a certain percentage of atmosphere. So if the remove 85% of the atmosphere, what does that do to the speed of sound? That is of course if they could calculate the amount of moisture in the air, which is a big factor in the calculation. Will Islam be the first to colonize mars? The existing religions have all survived by outgrowing and overrunning their less prolific counterparts. They have filled this world and may be best suited for filling others as well. And believers are more willing to endure hardship, suffering and loss in service of their god. Brett wants others to use the Internet for him. "Air pressure has almost no effect on sound speed. It has no effect at all in an ideal gas approximation, because pressure and density both contribute to sound velocity equally, and in an ideal gas the two effects cancel out..."
-I found this for you by using GOOGLE. It took me 10 seconds.